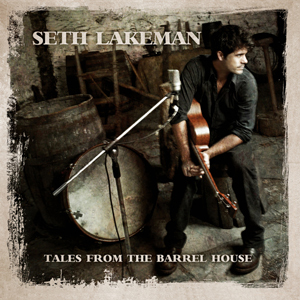 Celebrated folk singer-songwriter and virtuoso fiddler Seth Lakeman could not have dug deeper into his Devon roots for his 6th album, “Tales from the Barrel House”. He even descended into a disused West Country copper mine to record one track! The rest of the songs on this collection were laid down in the cooperage (The Barrel House of the title), the old smithy and other workshops at the ghostly Morwellham Quay mining port on the north bank of the River Tamar. In his boldest musical statement yet, Seth has not only written all the songs, but played every musical contribution himself, as well as producing and mixing the album. His usual bow-shredding violin riffs are there, as are his driving tenor guitar rhythms, but it’s the new primitive sounds he’s conjured up that give this album it’s atmospheric vibe. These include loads of what Seth calls “dirty viola”, banjo, bouzouki, a booming bass heartbeat from an old Salvation Army drum rescued from a junkshop, and a jangling array of percussion made up from bits of old iron or discarded tools found down the mine and around the Morwellham workshops. Blissful birdsong from the idyllic Tamar Valley opens the album, before rasping viola and scraping banjo shatter the peace and raise the nape hairs as first song “More Than Money”– an evocative tale of the hardships suffered by men working underground – kicks in. Committed and unflinching, it’s a call-to-arms for all labourers and artisans, setting the atmosphere for this album – solid, hard and uncompromising, like the granite bedrock of Seth’s West Country stamping ground. Seth says he has enjoyed this solo project like no other. “I’ve been aching to do something musically experimental like this for some time, to get right back to the basics of Kitty Jay [the ‘produced around the kitchen table for £300’ album that shot him to fame] and beyond. To be blunt, this is a concept album I could never have done with a major label.” Seth recently parted company from Relentless/Virgin Records after three albums. “I’m grateful for having worked in some of the best-equipped studios and with top producers, but with this record I feel free. I’ve not had A&R men looking over my shoulder or record bosses influencing me in any way. I was determined from the outset to do it as simply as possible, with just one recording engineer and as little multi-tracking and overdubbing as possible. We used just one sound field microphone. There wasn’t room for much more gear down the mine anyway,” jokes Seth. “But I think we managed to get the most authentic, truly ‘live’ sound. “I want listeners to feel they are down that mine, or in the barrel house, immersed in this living history while hearing the stories of the people who inhabit the songs. I’d like fans to literally feel the atmosphere in which the album was recorded. The theme I was seeking was to pay homage to hard-working miners, sailors, skilled craftsmen and artisans, who worked for little reward but took a pride in what they did. Challenging it may be, but this collection underlines Seth’s inate knack for writing both foot-stomping, sing-along songs and more tender, thoughtful ballads. His playing is often breathtaking and Seth’s trademark, soaring vocals are at the forefront of this album, as beguiling and haunting as ever. Charismatic, full of passionate energy and giving voice to people from the past, “Tales from the Barrel House” will entrance and enthrall a growing army of present-day fans and, undoubtedly, will also be discovered by lovers of heartfelt music – discerning folk – of the future.